The Scottish Parliament would be granted more powers over tax and social security if voters rejected independence, David Cameron, Ed Miliband and Nick Clegg have said. The leaders have published a joint declaration backing the "strengthening" of the Scottish Parliament. A spokeswoman for Scottish First Minister Alex Salmond said the vow was a "rehash" of old promises. 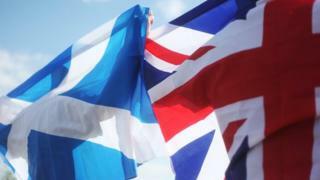 The Scottish referendum on independence is to be held on 18 September. It comes as Mr Salmond and Alistair Darling, the chairman of pro-UK Better Together campaign, are due to go head to head in a televised referendum debate later. The formal declaration - which has been signed by the Prime Minister Mr Cameron, deputy prime minister and Liberal Democrat leader Mr Clegg and Labour leader Mr Miliband - vows to strengthen the Scottish Parliament's powers over "fiscal responsibility and social security". It sets out plans to increase the powers of Holyrood "as swiftly as possible" after next year's general election - if Scotland votes to stay within the UK. The declaration says: "We support a strong Scottish Parliament in a strong United Kingdom and we support the further strengthening of the parliament's powers." "The Scottish Labour Party, the Scottish Conservative and Unionist Party and the Scottish Liberal Democrats have each produced our own visions of the new powers which the Scottish Parliament needs. "We shall put those visions before the Scottish people at the next general election and all three parties guarantee to start delivering more powers for the Scottish Parliament as swiftly as possible in 2015. "This commitment will deliver a stronger Scottish Parliament in a stronger United Kingdom." However, a spokeswoman for First Minister Alex Salmond said "no-one in Scotland will be fooled by this Westminster-led rehash of vague promises and unspecified more powers in the event of a 'No' vote - the Tories have tried that before". "David Cameron fought tooth and nail to keep a more powers option off the ballot paper, so how can anyone take him seriously now?" Scottish independence: What's going on in Scotland?